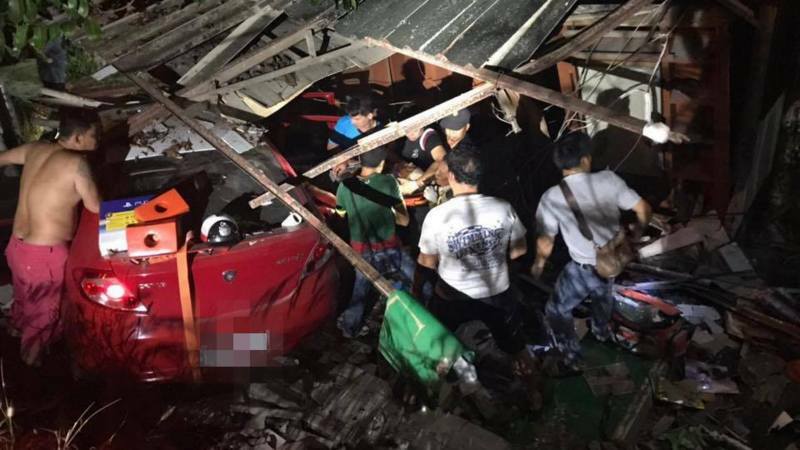 PHUKET: A Russian expat is in critical condition at Dibuk Hospital after his car slammed into a house in Kata last night (Jan 30). Capt Channarong Prakongkue of the Karon Police was notified of the accident at about 8pm. The driver, Russian expat Artem Primak, was recovered unconscious from the vehicle by rescue workers and rushed to Vachira Phuket Hopistal last night, Capt Channarong confirmed. “The accident was on Patak Rd, near the Karon Subdistrict Health Promoting Hospital (near the corner of Patak Soi 14, see map below),” he said. “We believe that Mr Primak lost control of the vehicle purely by accident. No other vehicles were involved in the incident,” he added. Capt Channarong confirmed that Mr Primak tested negative for alcohol, but declined to reveal further details. An officer at the Phuket Tourist Assistance Centre (TAC) told The Phuket News that Mr Primak still remains in critical condition. “We have not been told details, but we have been informed that Mr Primak remains in critical condition,” the officer said.